It was this letter from his friend and former teacher, John Stevens Henslow, Cambridge University Professor of Botany, that brought the 22-year-old Charles Darwin news of the offer of a place on board the Admiralty surveying vessel, HMS Beagle, on a voyage to chart the coast of South America. Charles returned on 29 August 1831 from a geological fieldtrip in Wales with another former teacher, Adam Sedgwick, to find the letter waiting for him at home in Shrewsbury. Henslow had been asked to recommend a young man as a companion to Robert FitzRoy, the Beagle's captain; Darwin was not the first choice for the trip, but a combination of engaging social skills and an already evident appetite for natural history, brought him to the top of the list when first Henslow himself, and then Leonard Jenyns, was forced to turn it down. 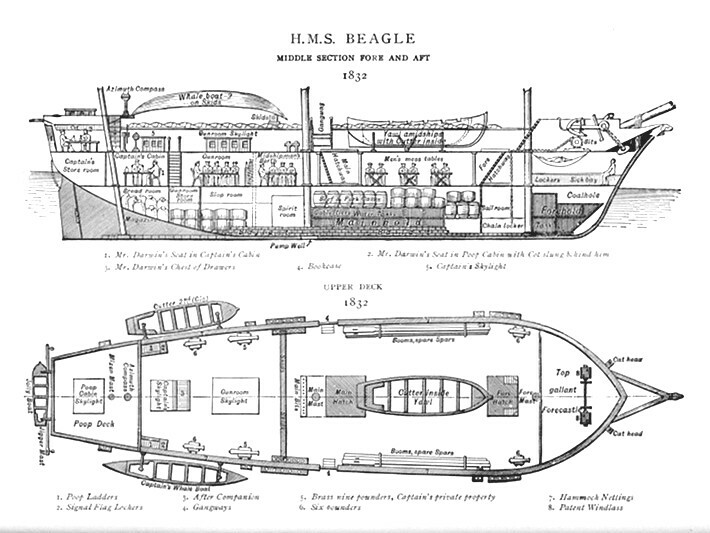 It took several weeks to pursuade his reluctant father, Robert Waring Darwin, to give his permission and finance the trip, and more delays were caused by the refitting of the ship and by bad weather, but when the Beagle finally sailed from Plymouth on 27 December 1831, Charles was on board. What was originally planned as a two-year voyage around the world stretched to five. During this time Darwin exchanged letters not only with his family, in particular his sisters, but with Henslow and others who could give him advice on how to make the most of the opportunities he had to observe and collect. See also The geology of the Beagle voyage. All the letters have been published and are available in an illustrated book Charles Darwin: the Beagle Letters. To find out more about the books that Darwin read during the journey, see the article on the 'Books on the Beagle'. JSH has been asked by Peacock to recommend a naturalist as companion to Capt. FitzRoy onBeaglevoyage. CD the best qualified person; not a finished naturalist but amply qualified for collecting, observing, and noting. Feels he should declineBeaglevoyage offer because of his father’s objections, which he lists. Would otherwise have taken all risks. [Geological] trip with Adam Sedgwick a success. Grieved at Marmaduke Ramsay’s death. States his views on each of RWD’s objections to theBeagleventure. JW’s overall position is favourable to CD’s acceptance of the offer. Has met FitzRoy, who has now offered him the post of naturalist on board theBeagle. Other details about the voyage arrangements – mess, CD’s status, route, books. Urges CD to return to theBeagleearly in November. Conrad Martens arrives to succeed Augustus Earle as artist for the expedition. Has had to draw bills totalling £217 in seven months. Is glad the Captain has decided to winter in Tierra del Fuego, because this will facilitate "glorious excursions" into the Andes. Has obtained fragments of fossil bones and part of aMegatheriumhead. Their long delay occurred because the charts were not complete for sending home. CD is now on shore because of seasickness. The family may not hear from him for a year. At sea 25 days from Galapagos to Tahiti, where they stayed ten days. It was delightful. Then three weeks to New Zealand, where they will be for ten days. Convinced of high merit of missionaries. Beagleis again in Brazil because of need to check on "singular disagreements in the Longitudes". Happily home, he sends thanks to his "first Lord of the Admiralty". Will visit Maer in two or three weeks.